Get the best in weaving with Handwoven from first-rate how-to projects, to inspirational artist profiles, and all the weaving news you will need to keep inspired. 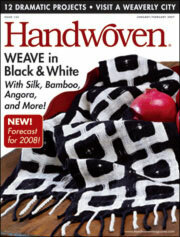 Every issue is full of the latest colors, fibers, and design ideas . . . that will send you to your loom.